Much like when an actor decides to record a music album, it takes a pretty arrogant wine writer to decide to make wine and even more so for a sommelier. Given that I’m both of these (I guess sorta the actor as well), for me to make wine would be an act of stupendous assholery that would have seemed impossible to achieve until Trump emerged as the Republican nominee in the 2016 elections. Still, it’s a question I’m asked often by visitors to Priorat and these days I’ll never say that I’ve made wine, but that I’ve made experiments in the form of wine. I’ve seen many writers that go around yabbering that they’re now “winemakers” after making 200L of something one year. This is a massive disservice to the people who have a) spent years actually studying the craft and b) are putting their asses on the line each year by producing thousands of bottles and then having to sell them. In case you didn’t know, making wine is quite easy but making good wine and then selling it is a fully different matter. But, after visiting a massive number of cellars from 2012-2014 and seeing how the amphora craze was sweeping over Western Europe, I gave a try to making an experiment using a ceramic vessel, 100% Grenache, and fully natural fermentation (which had some problems along the way.) Now with two years to it, I’m generally happy with the result and just share it with friends and family as it was never meant to be a commercial venture. To do it again would be to change many things that weren’t done well, but that was the point. I was hoping to take another stab at it in 2015. My professional winemaking friends rightfully joked with me about when my cellar will be registered with the DOQ, but given a slew of things happening during the harvest such as moving and Sommelier Certification, it was impossible to make a wine last year. And that sucked because 2014 was a nasty harvest while 2015 was wonderful. I hadn’t really intended to make another experiment in 2016 as grapes in Priorat and Montsant are getting pretty hard to come by if you want anything more than 500kg and even more so if you want a tonne which is pretty much the minimum to make a “real” amount of wine. Then one day I was chatting with a couple in Marçà. This is a village in DO Montsant, just next to the Priorat capital, Falset and they were saying they were really tired of this small vineyard they had. The local cooperative would pay them three years after they’d brought the grapes and as the vineyard was a small, 0.3ha, there wasn’t too much else they could do with it. They told me that if I wanted to harvest the grapes, they were mine. I nearly soiled myself as the chance to work with 60 year-old Carignan from bush vines was dreamy but when I visited the vineyard, the dark side of 2016 was all too apparent. The vineyard had been systemically infected by powdery mildew and a sane person would have not bothered harvesting it. While I usually regard myself as sane, I am determinedly headstrong and I really, really wanted to harvest the vineyard. The result was that after a long morning of work with a friend, tossing about 90% of the grapes that were infected, the result was a bit less than 200kg. This, in addition to my amphora guy selling the one I had ordered to someone else, made the clay path of aging all but impossible. Toni Ripoll of Pascona had agreed to let me use his cellar this year as the idea was to actually make a DO certified wine given that I thought I could arrive to at least 500kg. When I rolled up with this pittance of grapes, he told me to toss them in a tub and press it by foot, thus the photo above. Undoubtedly, people can’t wait to taste this “gem”. But it’s all part of the wine “experiments” as I also pulled out about 10L of juice to try a méthode ancestrale sparkling wine from the Carignan because… why not? If your boat gets a leak, light up the BBQ to deal with it. Well, while the main lot of grapes are happily fermenting in a stainless steel tank, the glass demijohn next to it got an acetobacter infection thus giving it that “natural” wine funk as the wine is quickly trying to become vinegar which is flawed wine but so many in this demographic love it. Oh, the fermentation also stopped, so in my living room, by the window is now a glass sphere of funk wine percolating. I’ll still bottle it off and give it to them but this is all part of a hand’s on learning in doing this. At some point will I actually get more serious about this? Sure, if someone tosses a wad of money in my direction and someone else with an actual wine education (as opposed to a book one) wants to keep me from falling off the balance beam. Otherwise, the Grand Vin de Pied 2016 will hopefully be coming your way early next year! “Molts mildew” indeed! Still, a lovely day out and I’m looking forward to trying whatever becomes of it all. I might opt for the stainless steel version, assuming you bottle it separately! You will be unshocked to know that “molt de mildiu” is actually correct. People usually call it globally “cendrosa” although I believe that only refers to the powdery variant but have yet to confirm this. Odium is oïdi. I’m sure the ancestrale will make for an excellent sparkling salad dressing. ¡Adelante! 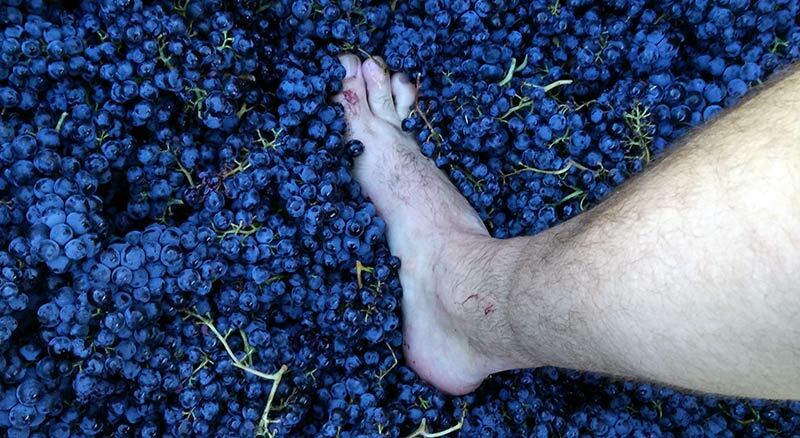 It’s good for everyone who’s into wine to get a little “foots-on” experience. I really liked your garnacha and hope you have the same success with carinyena. You’ve made the right move by working with a qualified winemaker. BTW, the fruit looks really good but I can’t say much about the leg.